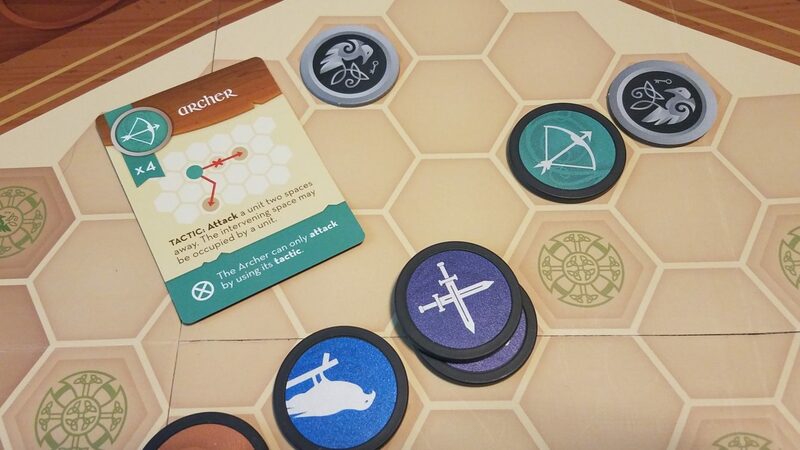 War Chest is a well-produced, austerely beautiful abstract strategy game. With a good bit of variety in its unit selection and a bag-draw mechanic to keep things interesting, War Chest has a lot to recommend...for those who enjoy chess-like abstracts, of course. Today I will be doing a solo review of a 2 player game (which is kinda sad, I know). But the fact that I enjoyedWar Chest and Jess…didn’t simply isn’t commentary on the game or its quality – she’s just not a fan of, well, exactly the sort of game that War Chest is, so she’s recused herself from offering her opinion here. 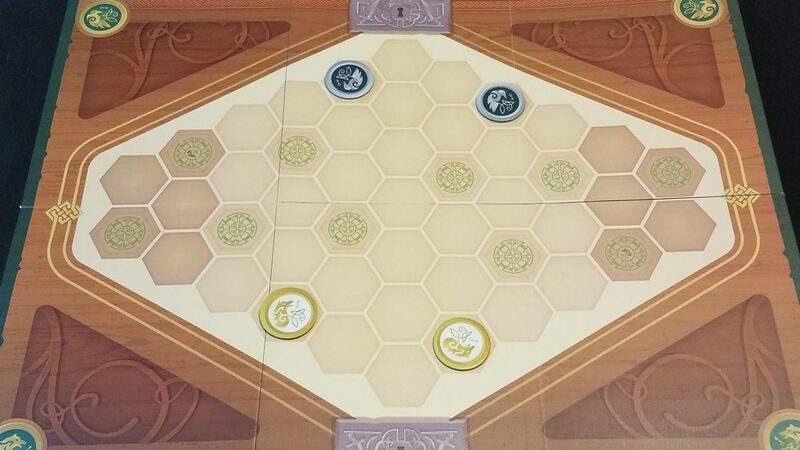 Confession time – early in Gameosity’s history (which is to say early in my time as a tabletop gamer), I really lauded games where theme and mechanics were seamlessly integrated, and derided those that weren’t. But as time has gone on, I’ve developed an appreciation for that great, oh-so-slightly generic genre known as ‘abstracts’. You know the type – the theme doesn’t matter, the goal is to win, and the mechanics are strictly utilitarian. But far from being soulless, a good abstract game tells its own tale through the virtue of its gameplay. In War Chest, that story is a classic – that of two medieval armies clashing on the (hexagonal) battlefield, each vying for control..
Each player’s army will be composed of 4 different types of units – and before we go much further, I just want to point out that War Chest is a strategy game, not precisely what we think of when we imagine a ‘war’ game. So the difference in these units is primarily in how they move across the field and how they interact with each other – there aren’t complex abilities to keep track of or any attributes to speak of. So as I was saying, 4 types of units, each one with unique characteristics, such as special methods of movement or the range or rate at which it can attack. Each unit is represented by the best part of War Chest’s production. 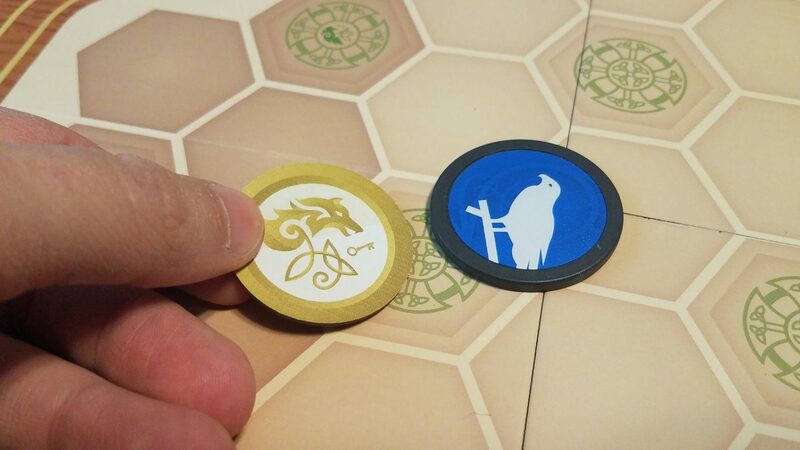 The unit coins are heavy plastic chips and feel fantastic – there is a tactile joy to be found in reaching into your army’s bag and drawing forth reinforcements to add to your hand, and a weighty finality to adding them to the board. 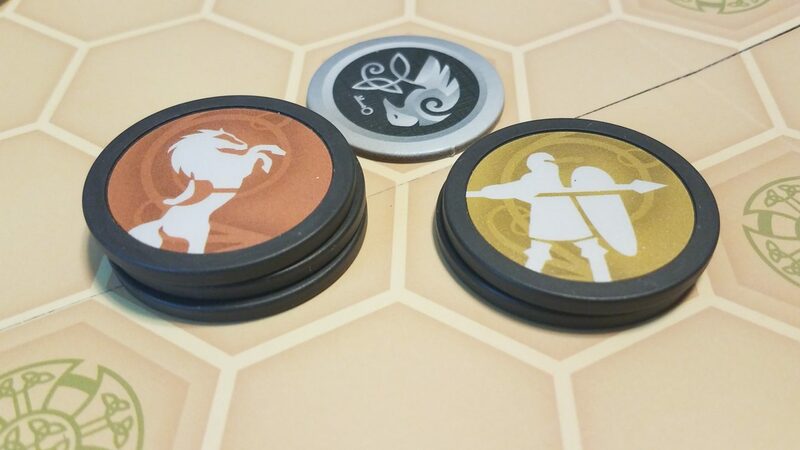 Each unit coin can be spent one of several ways – either to gain initiative over the round, to be deployed to the board to either create a new unit or bolster an existing one, or spent to activate a matching unit – moving, attacking, gaining control, or using that unit’s special tactic (if applicable). When units attack (either an adjacent unit or via one of their tactics), the target stack loses a coin permanently. Put it back in the box. That thing’s gone. 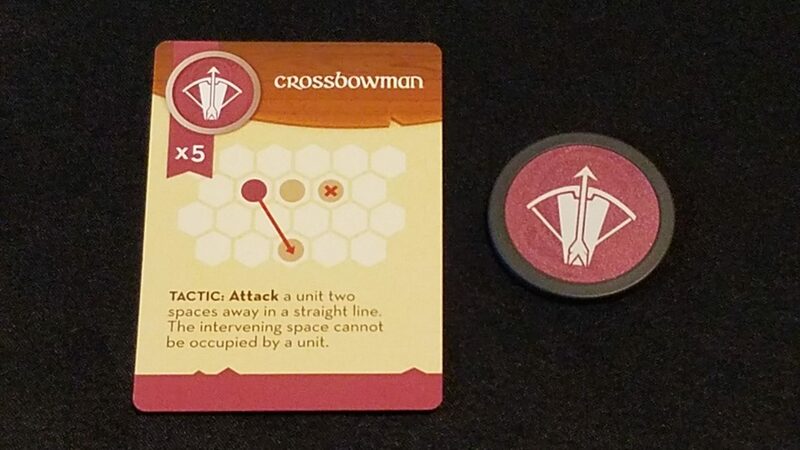 And surprisingly, I really like the permanence of that loss in War Chest – it is a game of ever-dwindling resources, so by definition it cannot go on forever, something that can make other tactical games drag on long past their welcome. 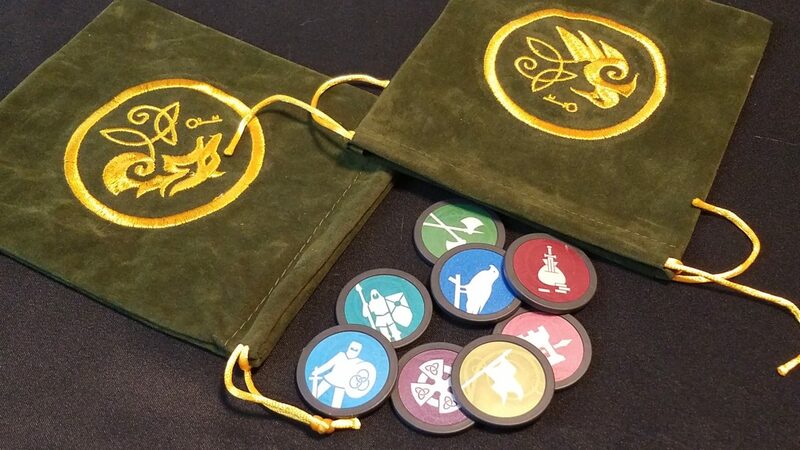 As I mentioned, your unit coins will begin tucked away in your bag, from which you will draw them as the game proceeds. Though it’s a small detail, the fact is that the bag adds a lot to War Chest. 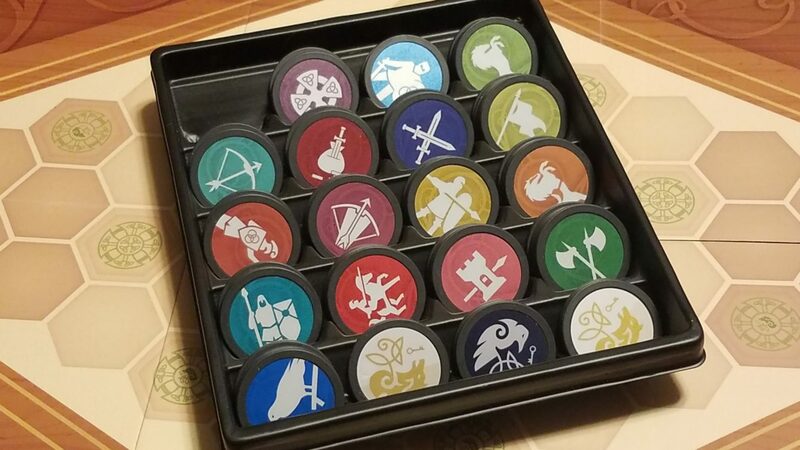 By simply randomizing the order in which players get their hands on their unit coins, the turn-by-turn strategies will be shaped differently from play to play, and the skill of keeping track of what your opponent has out and what has yet to appear is a key skill. Another thing to consider is that your supply of unit coins is finite. 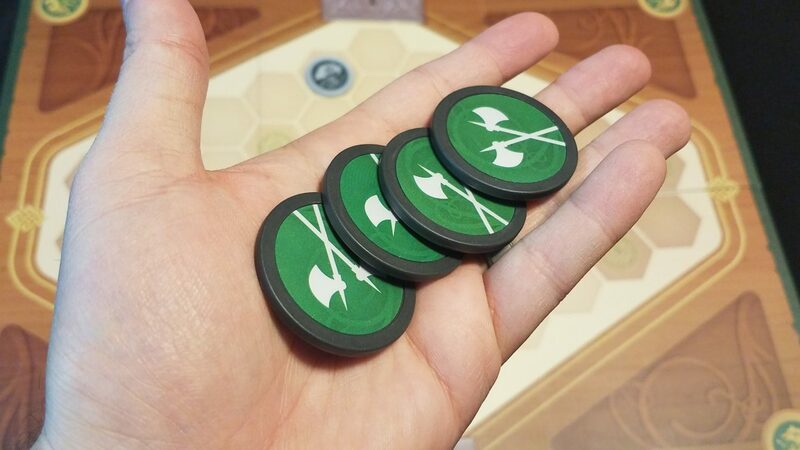 This isn’t just important when you consider your opponent will be constantly attacking to toss them back in the box – rather, since you need a coin of a unit’s type in hand to activate a unit, you must strike a careful balance between adding coins to the board to create and bolster your stacks, and leaving enough in the bag so that you can, you know, actually do something with them. War Chest is, simply, a fantastic abstract affair. The presentation is stark and minimalist, but the production is excellent, from the components to the graphic design, and I love the perfectly-portioned serving of strategic and tactical gameplay it provides. 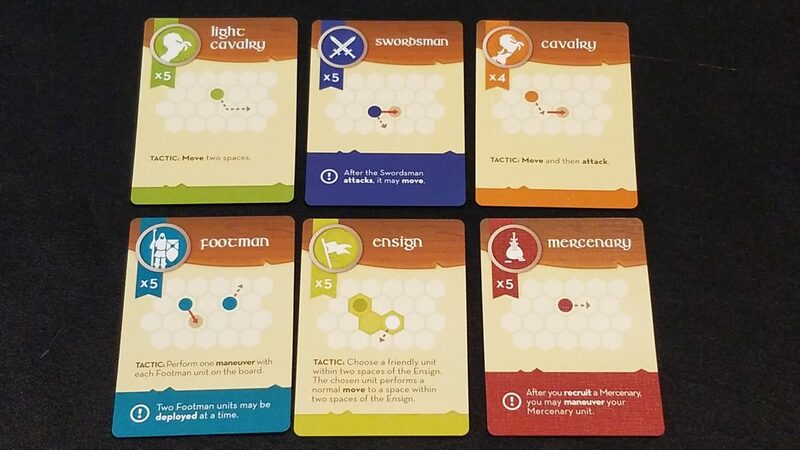 Now, the fact is that War Chest can be played with up to 4, by dividing each army into teams of 2. But to be honest, I haven’t tested gameplay at that number – I’ve treated War Chest as a 2 player affair, and I’ve enjoyed it at that count. Ultimately, I recommend War Chest for those who will enjoy the sort of gameplay it promises – tactical but still variable, contentious without being tedious, and engaging without being overly complicated. The quality of components, from the magnetic box to the coins, is top notch, and I really enjoyed every aspect of it. And the fact that my partner in crime didn’t just speaks to the reality that not every game is for every player – something that the wonderful panoply of games available can more than address.